In the days before social media, Twitter and TMZ, what happened behind palace doors did not filter down to the masses, who were largely ignorant of the lavish Christmas trees the royals decorated every year. But thanks to a 16-page illustrated supplement printed by the London Illustrated News on December 23, 1848, that landscape changed dramatically after Charlotte’s granddaughter, Victoria, became queen. 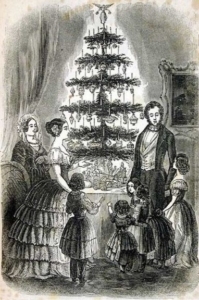 The supplement contained a woodcut engraving of Victoria, Albert, five of their children and a governess gathered around a table-top evergreen adorned with sweets and ornaments, illuminated by candles and topped by an angel. Unwrapped presents—dolls, mounted cavalrymen and a figurine in a horse-drawn chariot—encircle its base. The tree itself, with six uniformly spaced tiers of boughs, looked too meticulous to be real. It was a depiction of a picture-perfect family Christmas, worthy of a holiday card. Victoria was a trendsetter on a par with Princess Diana and Princess Kate from modern times. 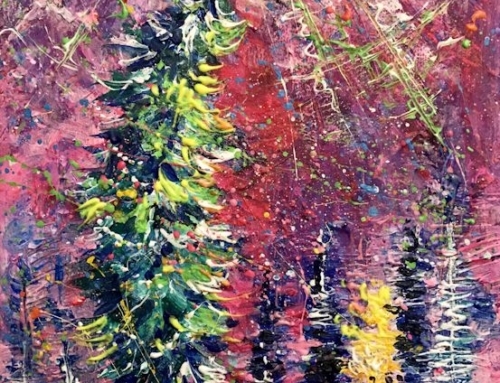 By the following year, everyone – rich and poor – was putting up Christmas trees. 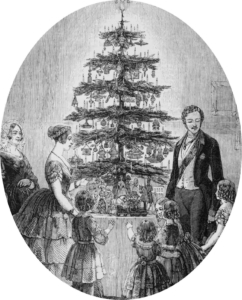 In addition to the London Illustrated News, Cassell’s Magazine and The Graphic started doing annual pieces on the royal Christmas tree phenomenon. And in 1850, the phenomenon spread to America. In that year, the Victorian Christmas tree engraving came to the attention of a woman by the name of Sarah Josepha Hale. In addition to being the reputed author of “Mary Had a Little Lamb,” Hale was the editor of a influential monthly magazine called Godey’s Lady’s Book. Hale “Americanized” the engraving – removing Victoria’s tiara, Albert’s royal sash and moustache, and the boxes of German biscuits from beneath the Christmas tree. The Godey’s engraving was one of the first widely circulated illustrations of a decorated Christmas tree in the United States, and it was soon followed by similar depictions in Harper’s and other major American publications. [The one to the right is an engraving by no less than Winslow Homer.] 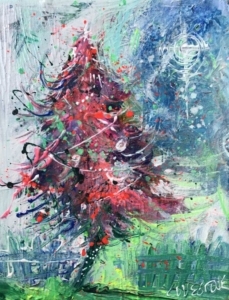 As a result, Christmas trees came into vogue in America as they had in England – as I’ll share with you in my next post.